Despite all the interest of using video as a means for observing public-initiated reactions, people never got beyond the state of contemplative passivity and their participation, which required only their concentration and a bit of their time, was rather limited. My performances, on the other hand, provided them with a ready-made framework. They would view the video and would become aware of the beginning and the end, which were imposed on them. With the photos (and the sculpture projects), I remove this narrative framework offered to them. Onlookers can be looking at a photo in the same way as they can be looking at still life. A priori, nothing has changed here since the onlooker remains in a contemplative state. But I challenge still life as I call for the onlooker’s full participation through their imagination that revitalizes the movement, and as such extends the image by mentally breathing life into it. Each person who takes the time to play the game creates a unique result that is absolutely individual. The work is just the vessel, the gateway to a flight of imagination, a moment of thought and daydreams. Art must be considered as an experience to be lived, rather than a cultural product to be consumed. But our wilful blindness and our widespread disconnection dictated by the laws of our societies prevent us from reaching this state of consciousness and this logic of experiencing the elements of life. Instant Zero stemmed from a simple observation: every night, an incredible event occurs and is repeated every “day”. It is this late point of time during the night, when the city begins to fall asleep, when the chaos of the day makes a pact with the silence of the night. When all life, all noise fades, when one can lay a hand on the cooled-down ground and feel the vibrations of the Earth. Instant Zero is this infinitesimal moment of transition between two acts during a theatre play, like a micro-silence instilled between a final instant and the applause that follows. That moment when the theatre lights are switched off or on, when the whole audience remains immersed in a twinkling of silence before the first reactions burst forth from this transition. These general examples lead me to the conclusion that every single second is a real experience to be lived. Instant Zero would be, as such, that moment when we could stop time just to become aware, take stock and realize. A break in our existence that would offer us the time required to really discover ourselves, our body, our surroundings, etc. A way of being fully involved in a sensorial phase, fully open to our perception, to better see this world, this life to which we become increasingly indifferent as the days go by. If we were to pay more attention to these short moments of transition, couldn’t we also become more aware of our existence in space and time? This is why I talk about this Instant Zero, a moment of potentialities. By extending this practice over a lifetime we could become masters of our own destiny, our own existence, and even achieve a form of alchemy … But before I go too far and risk flirting with utopia, I simply want to memorize these moments that drive us to awareness, to the full use of our perception and our imagination. In other words, becoming masters of our own destiny. I mentioned the role of the onlooker who had to identify with my photos; well this actually sums up my whole action. 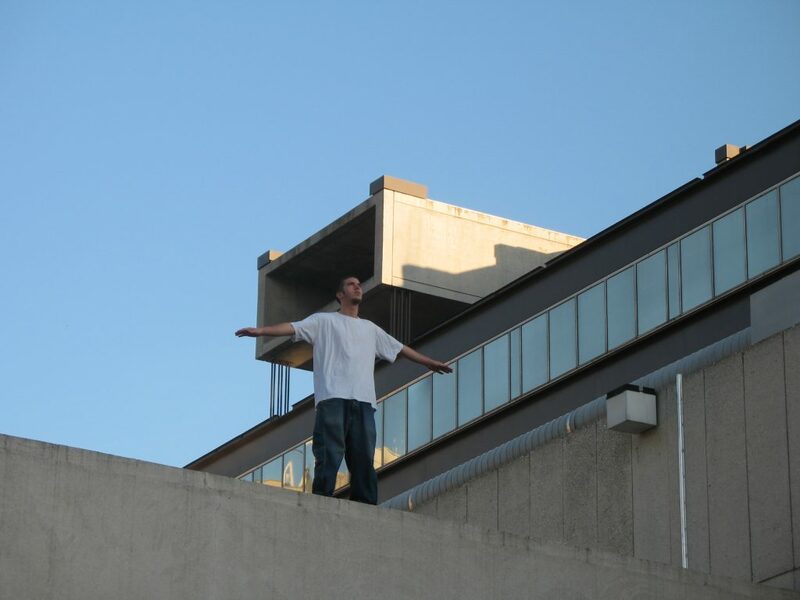 As part of the Instant Zero project, a person is standing on the edge of the void, on the rooftop of a building, arms outstretched in the air and eyes focused forward. Many immediately imagine an attempt at suicide. Whereas children are more likely to imagine the person taking off and flying. Gina Pane showed just how much our bodies and minds were alienated by society. And, I agree with her. And if we just took the time to be imaginative, innocent, creative, enterprising, …? I would like to conclude with this beautiful quote by Marcel Duchamp: “It is the viewer who creates the work”, and the one by Pierre Pilonchery: “I create reality”. Potentiality conceals all the components of life within. It was in this spirit that the Potentiality Shows were produced, logic sequel to Instant Zero, the study of potential, and all my work done before. These Potentiality Shows were expressed through whiteboard exhibitions, designed as vessels for people who could come and let their imagination run wild over the virgin surfaces. Variations of these contemplative experiences are interesting, such as opening a cinema to the flow of the public who would come along and sit facing the white screen in a room bathed in a very soft ambient light. On the same principle as Brian Eno’s Quiet Clubs, spaces could even be designed and dedicated especially to this immaterial experiment of art and of the experience to be lived, the experience of the potential of life. Art sheds its imprisoning and limited materiality to become its own immaterial perfection: an exchange of energy and flow, the very image of life itself. Description: A person is standing on the edge of the rooftop of a building, arms outstretched in the air and head raised to the sky.